As you all know, this year, the UK Parliament is set to vote on whether or not to replace the British Trident nuclear weapons system at an estimated cost of over £180 billion ($260 billion) and at a time when the government is slashing public spending on vital areas such as education, health and welfare services. The majority of people of the world want to see positive steps taken towards global nuclear disarmament – but talks and negotiations have been stalled for years. The majority of people in the UK, including the Labour leader Jeremy Corbyn, and other parliamentary party leaders, oppose nuclear weapons – now is an excellent time for a call to scrap them - not replace them. 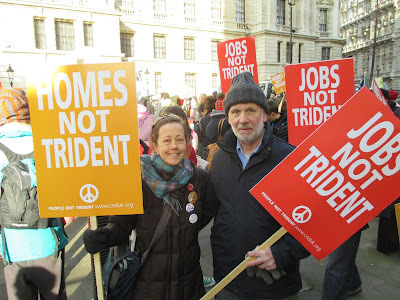 The UK Campaign for Nuclear Disarmament (CND) is therefore organising a national demonstration to protest against Britain's Trident on Saturday, February 27th in London. This message to ‘Stop Trident’ could prove to be a vital intervention ahead of the Parliamentary discussion. Please help us to get the message out loud and clear: we don't want a new Trident, we don’t want the current Trident - and the world doesn’t want nuclear weapons. We invite the international community to join us in saying “No” to UK government plans and “Yes” to global nuclear disarmament – the longer these weapons exist, the greater the possibility that they will be used. d) Hand in letters of protest to British Embassies and other representatives. Thank you - together we can abolish nuclear weapons once and for all.